These Old World treefrogs are found in India, Sri Lanka, China, SE Asia, Indonesia, Japan, the East Indes, and Madagascar; only Chiromantis is found on continental Africa. Sometimes the mantelline ranids are included in Rhacophoridae. In general rhacophorids are much larger than hyperoliids, some up to 12 cm. These frogs are mostly arboreal, with flattened bodies. Many species have broad, flat, relatively bony skulls. In many species the eggs are laid in arboreal foam nests, and the newly hatched tadpoles fall into water below to complete development. Some species have direct development. Rhacophorus nigropalmatus is known to be a glider, using its heavily webbed hands and feet to control its descent. Two subfamilies are recognized: Philautinae and Rhacophorinae. Schlösser (1979) and Dubois (1981) treated the mantellines as part of Ranidae. 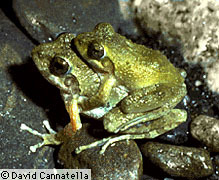 Channing's (1989) analysis of Liem's (1970) data indicated that mantellines were nested within rhacophorids. Therefore, if mantellines are excluded from Rhacophoridae, as in Duellman and Trueb (1986), the latter is not monophyletic. If at some later time the mantellines are demonstrated to be not nested within Rhacophoridae, the taxon as we have defined it will still be monophyletic, but it will not include mantellines. Channing's (1989) analysis listed six synapomorphies of Rhacophoridae, including mantelline ranids. Two of these are the fusion of the carpals and fusion of the tarsals. However, the polarity of these states is incorrect, given the widespread occurrence of these states in most ranids, except for arthroleptines and astylosternines. The other four synapomorphies are (1) only one slip of the extensor digitorum communis longus muscle, inserting on distal portion of fourth metatarsal, (2) outermost slip of the palmaris longus muscle inserting on the proximolateral rim of the aponeurosis palmaris, (3) frontoparietal trapezoidal, and (4) bifurcate terminal phalanx. The first two of these show limited homoplasy consistency index of 0.5 for both, and neither state is found in hyperoliids. The latter two show greater homoplasy (consistency indices of 0.33 and 0.2, respectively), and also occur in hyperoliids. If hyperoliids are not the sister-group of rhacophorids, then the presence of intercalary elements is a synapomorphy of Rhacophoridae, including mantellines. Channing (1989) listed seven synapomorphies uniting the hyperoliids and rhacophorids. However, given that his analysis assumed the monophyly of these two groups, these apparent synapomorphies may be simply be an artifact of the analysis. Three of these are related to arboreality (modifications of the muscles to the fingers and toes, and expansion of the digital tips). Two others (anterior process of the hyoid and shape of the eighth vertebra) have the plesiomorphic state widely distributed among both hyperoliids and rhacophorids. The last two of the seven are part of one transformation series, and describe the degree of exposure of the sphenethmoid. Page: Tree of Life Rhacophoridae. Old World Treefrogs. Authored by David Cannatella. The TEXT of this page is licensed under the Creative Commons Attribution License - Version 3.0. Note that images and other media featured on this page are each governed by their own license, and they may or may not be available for reuse. Click on an image or a media link to access the media data window, which provides the relevant licensing information. For the general terms and conditions of ToL material reuse and redistribution, please see the Tree of Life Copyright Policies.